Certain gems, cut in special shapes, look as delicious as candy. Perhaps the sweetest of them all is the sugarloaf. A dome with sculpted corners, the sugarloaf is more refined than a cabochon and only cut when the rough gem is just right. The shape has always been a rarity, a bit of a gem unicorn. 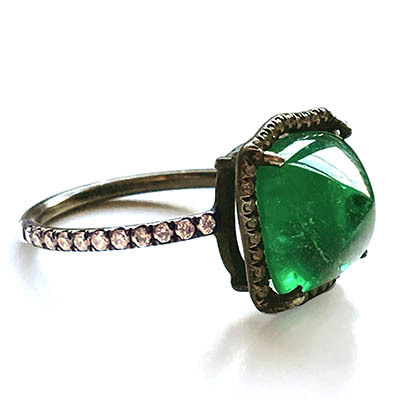 Historically speaking sugarloaves appeared most often in gorgeous 1920s art deco rings, but they can be found in beautiful jewels throughout the twentieth century. The genesis of the name is a bit of a mystery. Some believe it was inspired by the conical form sugar was once sculpted into before the invention of the sugar cube. Others think, it was named after Rio’s dreamy Sugarloaf Mountain. No matter the origin of the moniker, the gem shape is something gorgeous. When Savannah Stranger locked eyes on the Gemfields emerald sugarloaves, she found them completely irresistible. 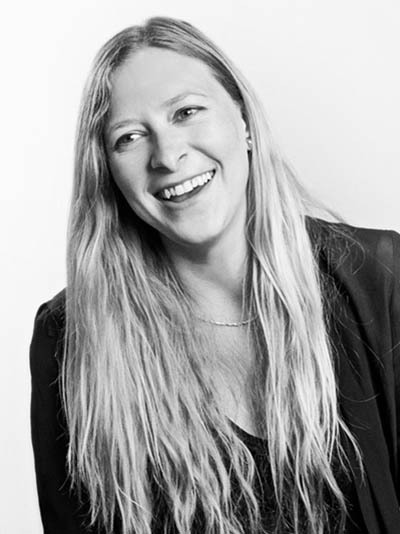 The Los Angeles based designer who specializes in artistic cool-girl pearl jewelry told me all about her collection and why the sugarloaf emeralds were just the right gems for her contribution to the Gemfields x Muse collaboration. 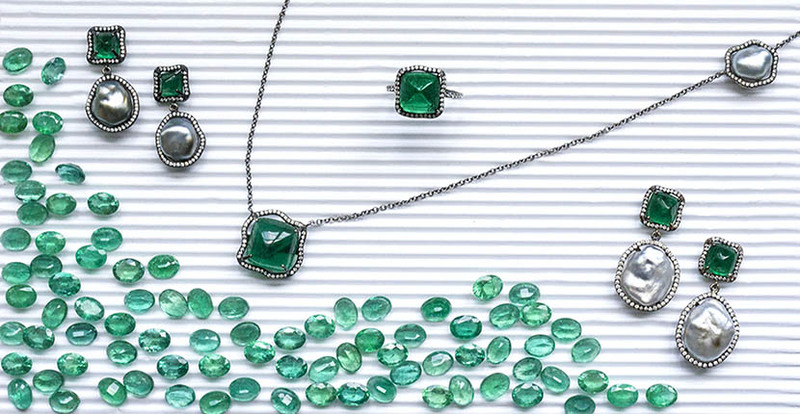 Before we talk about your Gemfields emerald jewels, tell me about your collection. My life in jewelry started when I was 17-years old during a trip to Tahiti, where I fell in love with pearls and the cultivation process. The artist in me was completely enchanted with the interesting organic and asymmetrical nature of the Keshi and baroque pearls. To me, they are more interesting than round pearls. The surface of these pearls is like a moonscape. After my first visit, I returned to Tahiti every summer for 7-years to learn about pearls and eventually worked in the pearl business for some very big brands. In 2013, I finally launched my own collection with Keshi and baroque pearls as the central focus. Until now, your jewelry has been about neutral colors with white, grey and black pearls, diamonds, yellow and white gold. 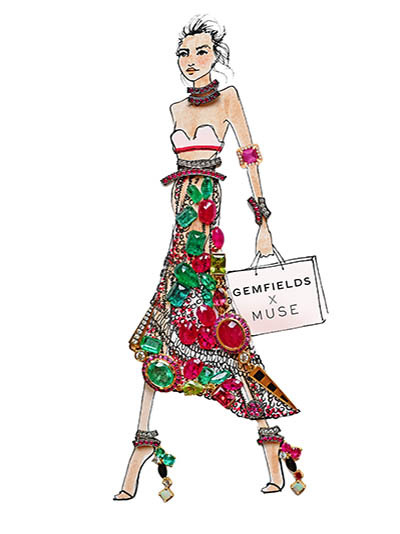 How did adding bright colored stones for the Gemfields x Muse collection change things? Actually, shortly before I had the opportunity to be part of the collaboration, I wanted to start adding color to the collection just in the settings surrounding the pearls. 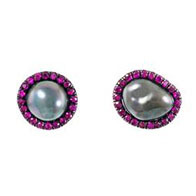 I thought colored stones would pick up on the natural rainbow in the luster of the pearls. Jennifer Shanker, at my showroom Muse, suggested I go to Gemfields. 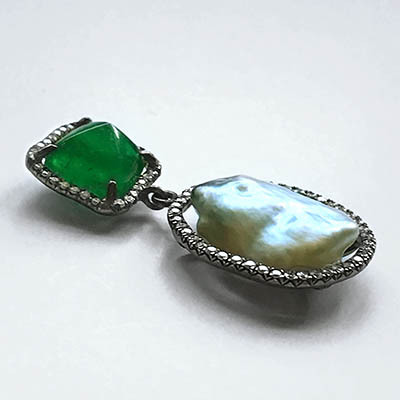 When I was reviewing the stones and telling them about how the shapes of the pearls inspired my designs, they showed me the sugarloaf emeralds. I was blown away but wasn’t sure what I was going to do with them at that moment. My first designs with Gemfields stones feature rubies which are so pretty and bright and full of fire and life. Then four or five months lather the collaboration with Gemfields and Muse came along and I knew I had to use the sugarloaf emeralds. What attracted you to the Gemfields sugarloaf emeralds? I love that they have angles as well as a soft appearance like the Keshi pearls. They have an organic feel. The richness and color blew my mind. They also have a vintage, romantic spirit about them. They remind me of something my grandfather would have bought my grandmother during the 1920s in London. Tell me about your designs for the emeralds? I created halo settings with unique negative spaces for each one, similar to the way I do for the Keshi pearls. It’s a logistical headache for my manufacturing team who are all here in Los Angeles but it’s important to me. Every pearl is unique therefore every setting is unique. The nice part of all the effort is it means each piece is one-of-a-kind. For the emeralds, I wanted there to be an organic quality on the halo even though they are more of a symmetrical shape than the pearls. I did 10 or 15 drawings for every one to find the right form. For the earrings and ring that features a 5-carat emerald, there are gentle curves around the gem for functionality and fit. 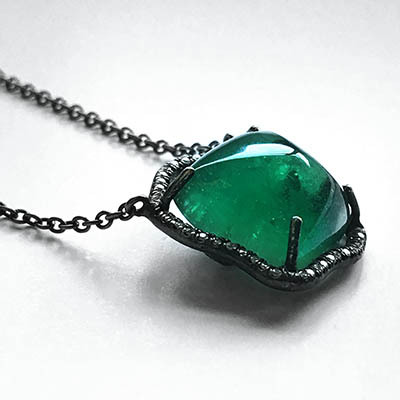 For the necklace that has a 10-carat emerald, I could really open the negative space around it to show some skin behind the jewel. What inspired the black metal for the jewels? 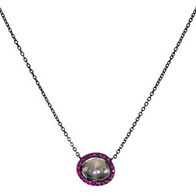 It is 18K white gold with a black rhodium finish. I love the black with the diamonds because it adds contrast. It also makes the color of the emeralds pop more than any other color of metal. I feel the contrast is contemporary. It draws your attention visually. I was very drawn to it. It follows my approach to jewelry manufacturing. I use as much recycled gold as I can. 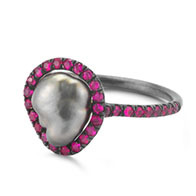 Tahitian pearls are very ethical in terms of the environment. Whenever there is a great story like Gemfields that is changing the way mines are handled, it is something I want to be a part of. Hopefully they will inspire change and more people will want to follow in their footsteps.